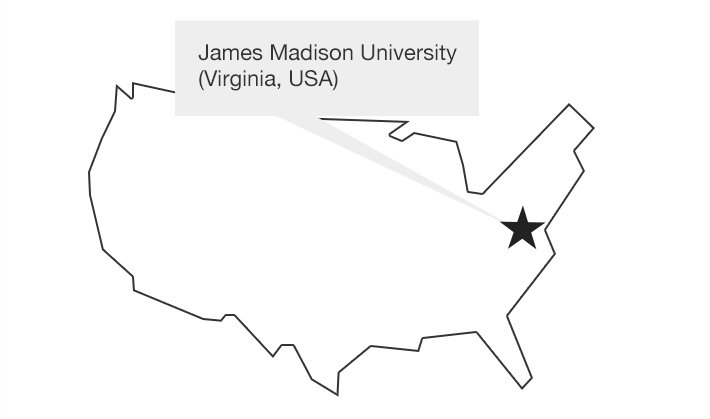 Situated in the heart of Virginia’s beautiful Shenandoah Valley, James Madison University offers 124 bachelors, masters, and doctoral degree programs, and is home to 21,227 students. In the 119 years since its founding, the university, named after the fourth President who historians frequently honor as Father of the United States Constitution, has undergone many changes. One thing that hasn’t changed, however, is the school’s culture of innovation. From the installation of the first on-campus radio in 1922 to the installation of the world’s only state-of-the-art hybrid planetarium, James Madison University is an exciting place for students, teachers, or visitors, particularly for those who believe technology’s potential is inextricably linked with the future of higher education. To equip the university’s new College of Health and Behavioral Studies Building with the best-available high-tech teaching tools while continuing an ongoing multi-phased project to upgrade almost 400 on-campus classrooms in older buildings with next-generation laser projection technology. Deploy 60 Panasonic PT-RZ570BU HD laser-phosphor projectors and multimedia teaching and control podiums in every classroom of the new building, and ongoing replacement of legacy Panasonic PT-FW300 Series and PT-FW430 Series LCD projectors in existing classrooms with laser-powered PT-RZ570BU units. A huge increase in brightness, clarity, and resolution. Increased faculty satisfaction. Expanded ability to offer plug-and-play BYOD (Bring Your Own Device) access to projectors. Extended service intervals that allow all scheduled maintenance to be performed between semesters when classes are not in session. Another semester over. James Madison University’s 21,227 students are home getting a well-deserved rest. Classroom Technology Specialist Jackie Woolf and her coworkers are busy installing, maintaining, and upgrading the computers, audio/video systems, network, and in-class switching controllers and other state-of-the-art electronic teaching aids that have been an integral part of every JMU classroom since the turn of the 21st century. Unlike most enterprise and educational users of sophisticated, multi-hundred-unit projection systems using complex controllers to mix input from numerous archived and live input devices, JMU does not rely on outside integrators to design and install its systems. Every aspect of every installation, right down to the grunt-work of routing thousands of feet of cable, is done in-house by Ms. Woolf and her team. Which made the brief time between construction wrap-up, faculty move-in, and the September 2016 opening day of classes in the new College of Health and Behavioral Studies Building particularly “interesting, to say the least,” Ms. Woolf said. “We are continually upgrading our classrooms as technology advances, so we knew we wanted laser projection. Selecting Panasonic to supply those laser projectors was based on more than the PT-RZ570BU’s unusually bright [5,400/5,200 lumens] and evenly illuminated image, 20,000:1 contrast ratio, and up to 20,000 hours of maintenance-free operation. “Way back when, as we expanded the system, we realized that the one thing we wanted was projectors designed to make our lives as easy as possible. We needed that because we have a lot of classrooms, some with more than one projector, and we had to find the most reliable, low-maintenance projectors available,” Ms. Woolf explained. One of the units tested was the Panasonic PT-FW300, but the trial was far from fair. “For some reason or other, we decided to try the Panasonics in one of the dustiest buildings on campus and, as it turned out, we just loved them,” Jackie Woolf continued. “Seriously, even the lamps were incredible, some of the 300s we’re replacing with lasers right now have about 7,000 hours on the original lamps and are still in use every day. JMU’s US$45.6 million College of Health and Behavioral Studies Building, opened in early September 2016, features 17 classrooms, 13 research laboratories, and 19 teaching laboratories. It has two lecture halls with seating for 165; a speech, language and hearing clinic; a food production laboratory; and a patient simulation laboratory. 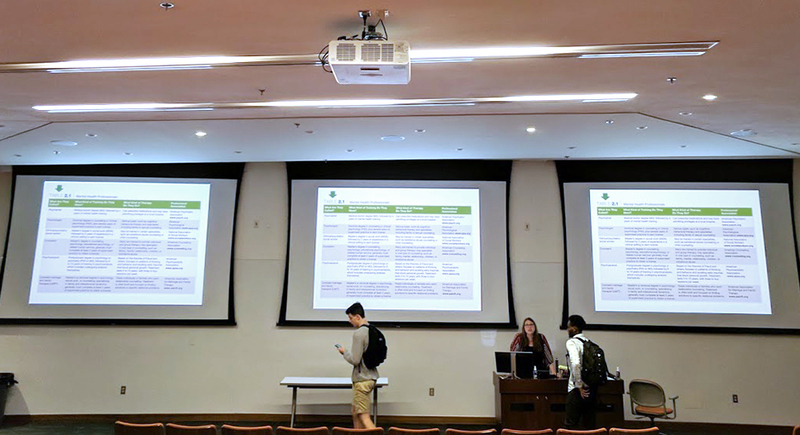 Depending on size, each of the classrooms and lecture halls has one, two, or three PT-RZ570BU projectors, motorized 8 ft., 10 ft. or 12 ft. screens, and a “teaching console” that utilizes an Extron CrossPoint System to give instructors and lecturers access to numerous data streams. These can be instantly selected and projected via a touch panel. 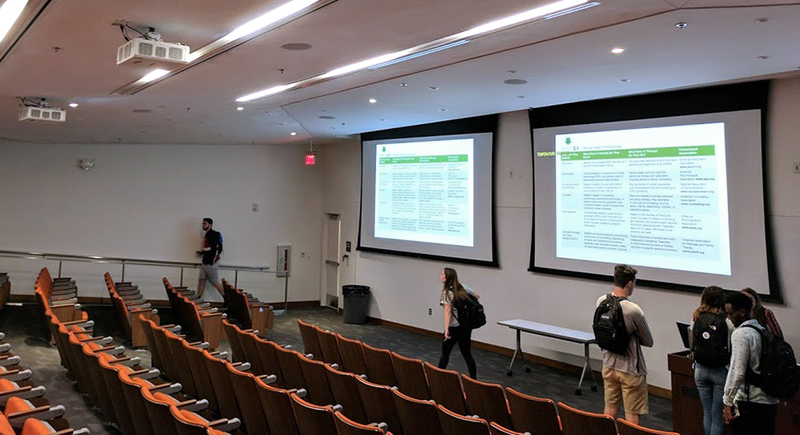 Regardless of which controller is used or what media source is being projected, Jackie Woolf is sure of one thing: there is a huge difference between the image quality of the PT-RZ570BU laser projectors and JMU’s previous LCD projectors. Better overall picture quality, finer detail, brighter images—those are the kinds of improvements users would be expected to rave about. However, there is one other advantage the PT-RZ570BU brings that has garnered such ecstatic feedback that even Jackie Woolf seems a little surprised. 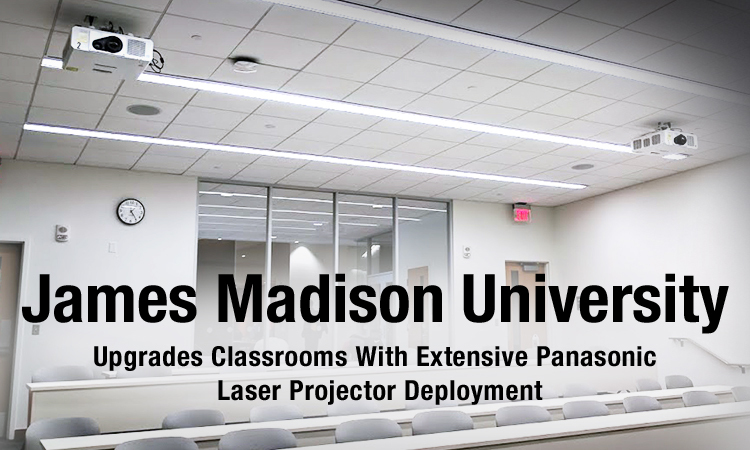 For decades, Panasonic has actively sought out and integrated feedback from higher education institutions in every area, from bulb replacement design to on/off intervals, so projectors from the PT-FW300 to the PT-RZ570BU are literally designed for the classroom. Paired with their stunning image quality and high-performance reliability, Panasonic laser projectors are at the top of the class. 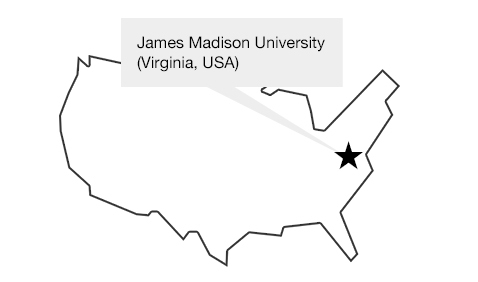 “James Madison University” Download PDF is here.